home-eco nanay: Alonzo's Birthday Balloon Surprise! I wish I could claim credit for thinking of this brilliant idea. 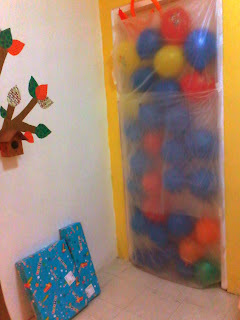 The plan is to surprise the birthday guy with an avalanche or cascade of balloons on the morning of his birthday. This has been at the back of my mind since the day I discovered about it at Pinterest. Note: Hubby and I co-sleep with our son so we had to do this step in 2 stages, only partially covering the bedroom door. Otherwise, it would be difficult to fill the door with balloons and we would have been "trapped" inside until our little guy's waking time! We woke up at 4 A.M. to complete the set up. Success! The birthday boy is happy!